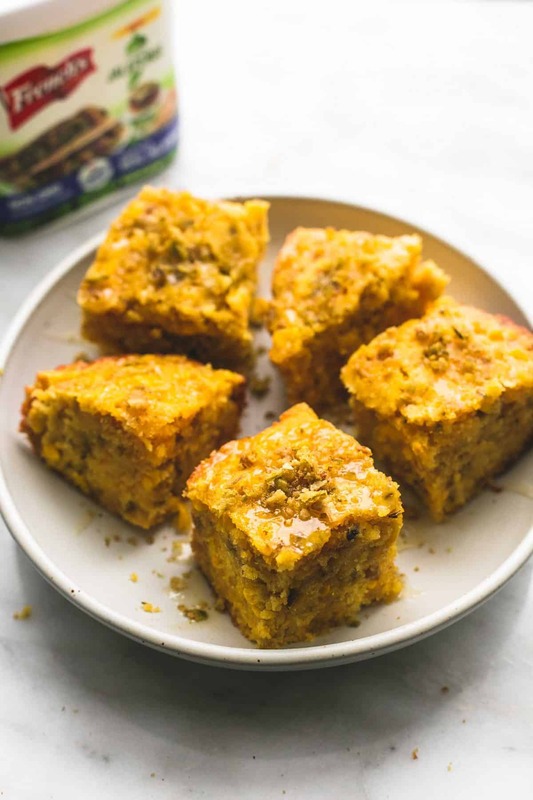 Save room in the oven and use your crockpot to make Slow Cooker Honey Jalapeno Cornbread with the perfect texture and balance of sweet and savory! Let’s be honest, when it comes right down to it, I could live without the main dish at holiday dinners. Turkey and ham, I like em, but when all is said and done I leave a liiiiiitle corner of my plate for the bird or the hog, and the rest is devoted to all the side dishes. Because that’s where it’s at. The potatoes, the buttery rolls, the cranberry and green salads. That’s where my heart is really happy. And every year I try out a few new side dish recipes for the holidays and one, maybe two make it onto my Must Have Every Single Year list. This year my new obsession is this cornbread. Game. Changer. 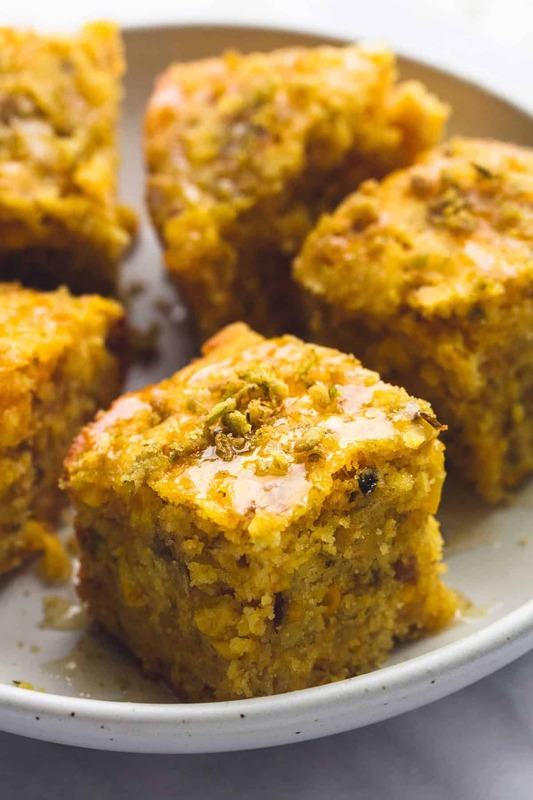 This Slow Cooker Honey Jalapeno Cornbread is out. of. this. world. Absolutely, hands-down, one of my favorite side dishes I have tried to date and I swear I could eat the whole entire batch by myself. 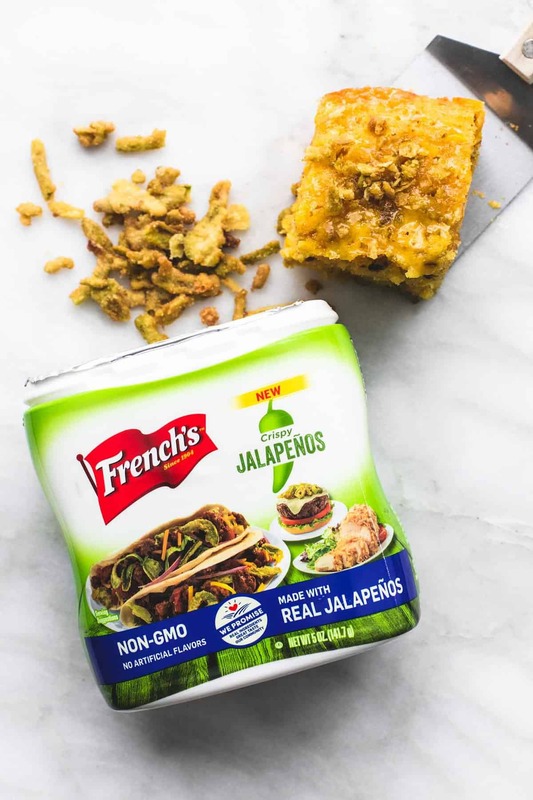 of the new French’s Crispy Jalapenos, it’s got a little bit of a kick. These Crispy Jalapeños are spicy, crunchy and best of all made with real jalapeños. If you’re worried about it being too hot, don’t stress at all, it’s more of a sweet heat and will absolutely not burn even a really sensitive tongue. I like to top mine with lots of extra Crispy Jalapenos for an extra boost of texture and heat, plus it looks really pretty! Use baking powder. This is a must for getting that cornbread to cook evenly and get a nice golden crust around the edges! Use a combination of corn meal, and whole corn kernels. Frozen kernels work well, and you don’t even need to thaw them first, they’ll thaw and cook in the slow cooker. You can also use canned corn, but be sure to drain and rinse the corn first, and pat it dry with a paper towel so it doesn’t add too much moisture to the cornbread. Add a sweet component. Using sugar in the cornbread batter itself, then drizzling warm honey on top just before serving gives a nice balance of flavor. THE TOWEL TRICK. About 20-30 minutes before serving, remove the slow cooker lid, drape a kitchen towel over the pot, and return the lid so that it rests on top of the towel. The towel will absorb excess moisture and ensure a nice golden crust that isn’t soggy. In a large bowl combine cornmeal, crispy jalapenos, flour, frozen corn, cheese, sugar, baking powder, and salt and stir to mix well. Mix in eggs, broth, and melted butter until completely incorporated. Pour mixture into prepared slow cooker. Cover and cook on high for about 2 hours. About 30 minutes before serving, remove the lid, drape a kitchen hand towel over the top of the slow cooker, and return the lid on top of the towel. 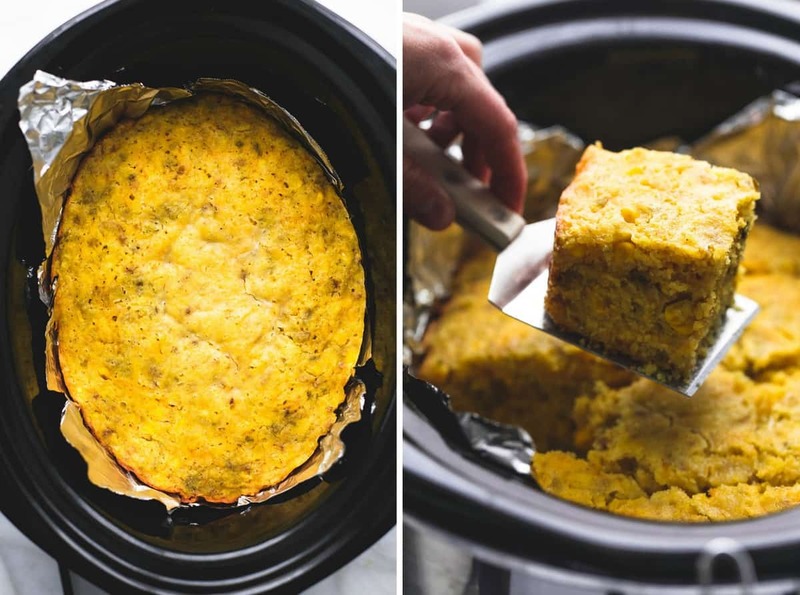 Once ready to serve, grasp the edges of the foil and lift the cornbread out of the slow cooker. Place on a flat surface and cut into serving portions. Drizzle with honey and top with additional crushed crispy jalapenos if desired and serve. This post was brought to you by the makers of French’s®. I received compensation to write this post through the #RealFlavorsHaveCrunch program. All opinions expressed are my own.. Try these other Christmas Side Dishes you'll love! 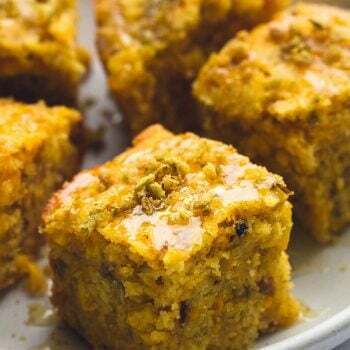 Omg, this cornbread looks amazing!! I can’t wait to try it myself. Thans for sharing! have to break my slow-carb thing for this, but then again 1 day per week is allowed to go off script, and corn bread is my krytonite, so i’m folding this in for that day, bonus is the jalapeno twist, thank you for this recipe! Hi Gale – The recipe calls for 1 1/2 cups of white flour. sorry for any confusion. Could I just Bake this in the oven? Probably! I’d try a 9×13 pan at 325 degrees until a toothpick comes out clean! I’d love to hear the outcome! !